Shorefast is a charitable organization situated throughout Fogo Island, Newfoundland. Fogo Island, being an island off of an island, is an ideal destination to experience authentic Newfoundland culture as all of the province's charm seems to be magnified based on its remoteness. Its communities, landscapes, and wildlife are mesmerizing and each community offers its own look into the potential hardships of living on a weather-beaten island. Although the island is intriguing in itself, it's safe to say that Shorefast contributions truly make it the world-renowned travel destination that it is. Shorefast’s most well known project is the Fogo Inn as it’s been covered on countless media outlets around the world such as GQ Magazine, The New York Times, National Geographic, and Forbes. Understandably, a lot of the press focuses on its architecture, amazing views, and top-tier hospitality, but aside from these noteworthy talking points the Inn's environmental consideration is almost just a compelling. During the construction of the building, every environmental consideration was well-thought out and the building now operates as a consciously low-impact, luxury hotel. When there, it's easy to realize how meticulously thought out the Inn's construction was and it's not surprising to consider how the Inn was built to utilize its natural environment wherever it can. First, the water used in the Inn's toilets, laundry and kitchen appliances is fed through a rain collection system that's stylishly laid out in a manner that, unless told, could just be seen as a design element on top of its roof. Throughout the top of the Inn there lies various rectangular rock gardens that subtly act as the catching basins for each rain fall. 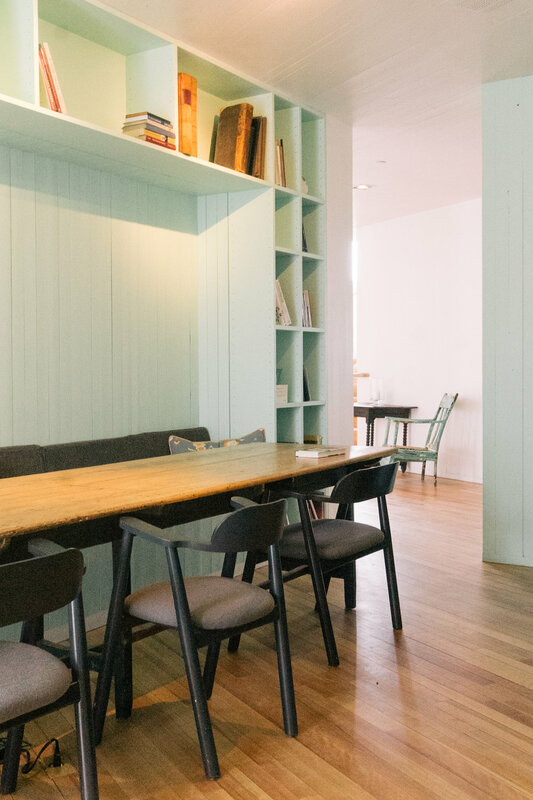 In addition, the Inn has an extensive wood-fire boiler system that supplies hot water for the in-floor radiant heating, the laundry, and the kitchen equipment. The wood collected for the boilers is supplied from the mainland in a manner that his highly conscious of its environmental impact. In addition to the boilers, one of the buildings is topped with highly efficient solar-thermal panels that also helps in the heating of various areas throughout the building. Solar-thermal panels stylishly cover the entirety of one of the buildings. The actual building was built using locally sourced, sustainable materials wherever they could with the ‘use every last piece’ mentality throughout. Even all of the furniture, blankets, and housewares were made by resident craftsmen using local materials when possible. While walking throughout the Inn, it feels as if almost every piece of wood in the building has a story, and, the odds are high that it very well could. For example, each blanket is hand-made locally using scraps of fabric from various worn clothing garmets. Look closely and even the legs of the tables are used from a single piece of wood. In addition to its impressive environmental considerations, the Inn is rich in history and takes pride in its heritage. A lot of the details throughout the hotel are representative of the local communities; the books in the library have been donated by Dr. Leslie Harris (former president of Memorial University of Newfoundland), the fish served is all caught locally off the island, the berries served are foraged in neighbouring forests and foods are preserved using traditional root cellars. The Fogo Island Inn perfectly blends a luxury experience with environmental, social, and culturally respectful practices. The hotel truly shows that luxury does not need be over abundant or damaging to the local landscape and that both worlds can exist in harmony. Fogo Island's history and heritage is rooted in the local fishing industry, making the health of the ocean that surrounds it vitally important. Understanding this, Shorefast has created the ‘New Ocean Ethic’ to make Fogo Island, and neighbouring Change Islands, a model of responsible ocean stewardship for the rest of the world. Part of the New Ocean Ethic program is the introduction of "cod potting" and their own fish supply company, Fogo Island Fish. Cod potting is a form of fishing that keeps the fish alive at sea, providing a better quality catch while minimizing the negative ramifications of lesser controlled fishing techniques, such as bycatch. In addition, through Fogo Island Fish, they individually catch cod one-by-one with a single line, ensuring a premium product and increasing the price that fishers are paid for their catch. In addition to providing the means for local fishers to increase their profits, Fogo Island Fish also works closely with the local fish co-op to supply additional work and support for local business. And, on top of that, all proceeds made through Fogo Island Fish goes directly back into Shorefast which goes directly back into the community. 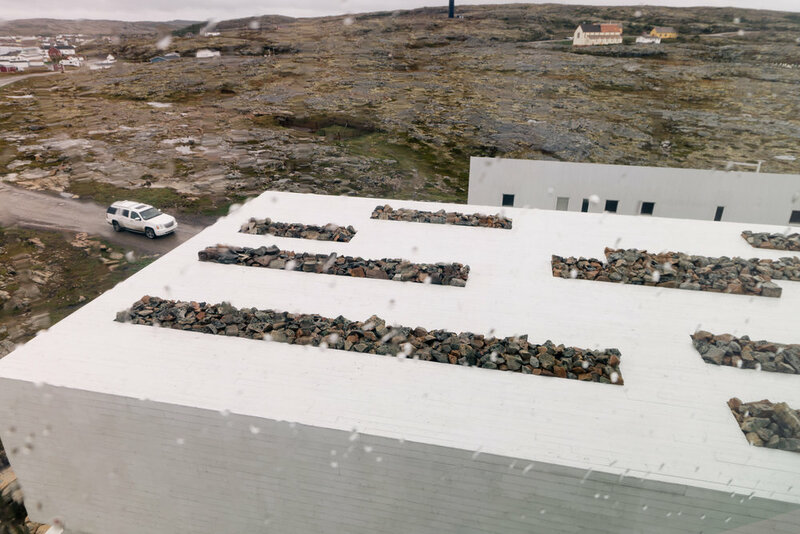 In addition to their environmental initiatives, Shorefasts Fogo Island Arts program is definitely worth mentioning. The program provides international artists residencies and provides each artist one of their studios and a residence in a local community. Through the program the artists are supported through artistic exploration and creation while being afforded the opportunity to become inspired by the island. Designed by a native Newfoundlander, Todd Saunders, the studios are located throughout the island and each take a 10-15 minute hike to reach. Each studio is completely off the grid being equipped with compostable toilets, solar powered electricity, and wood burning stoves. The studios all have a beautiful, full view of the ocean and provide a secluded environment to allow each artist to focus on their craft. Once each residency is done, the artists are given the opportunity to showcase their work at the Fogo Island Inn's gallery and network through Shorefasts growing connections throughout the arts worldwide.